Newtown and Chilwell (borough, town, city 1858-1993) were west of Latrobe Terrace, Geelong. 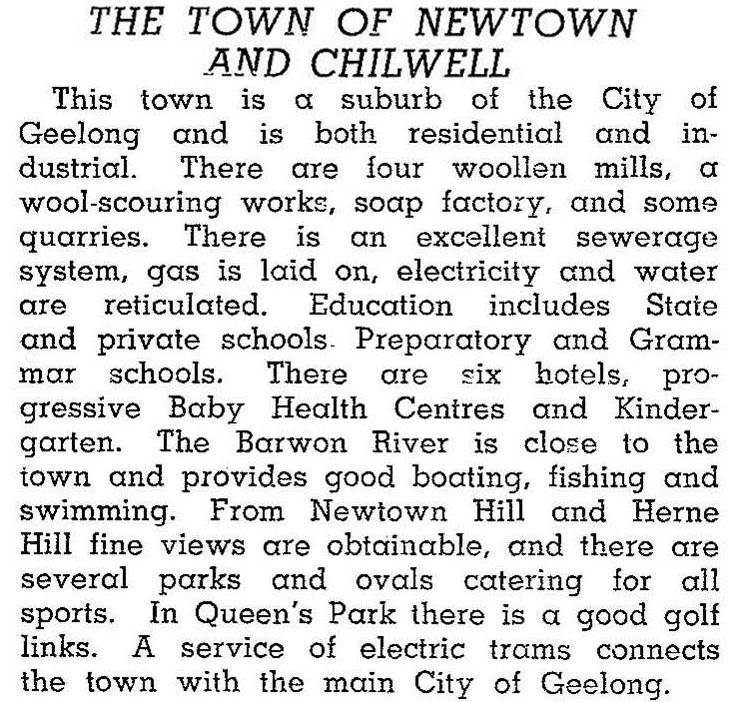 The former municipality is now the suburb of Newtown in Greater Geelong city. Newtown was north of Noble Street, extending to Aberdeen Street, and Chilwell was south of Noble Street, reaching south and west to the Barwon River. Land sales in Newtown and Chilwell began in 1839. The name Chilwell came from James Austin’s property at the north-west corner of Latrobe Terrace and Noble Street (1848), named after Chilwell, Nottinghamshire, near where Austin’s wife was born. Newtown, with less river frontage than Chilwell, developed somewhat later than Chilwell. The name signified a later or new settlement. 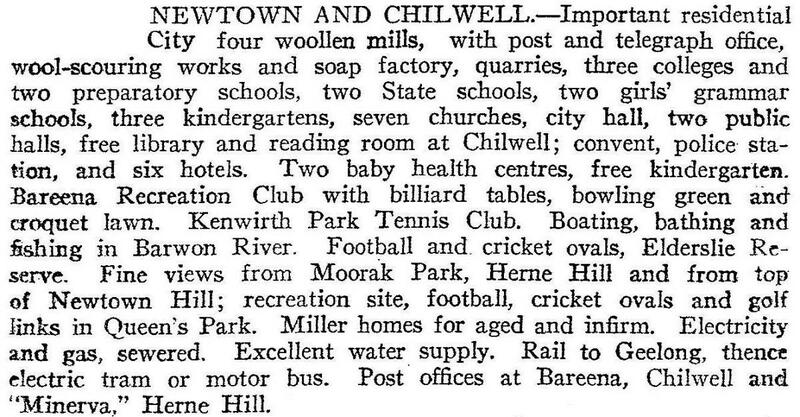 Industries such as tanneries, wool scours and soap works favoured Chilwell’s river frontages. Churches and houses of the more prosperous residents favoured positions away from industry, such as Noble and Aphrasia Streets. Methodist and Baptist churches opened in 1854 and a Catholic school opened the same year. Some other denominations continued to attend churches east of Latrobe Terrace in Geelong. Four years later residents, unhappy about Geelong council’s inattention to their needs, succeeded in having their area made a municipal borough. The council met in the Duke of Wellington hotel until it built its own offices in Pakington Street in 1860. Aphrasia Street, Newtown, was the site of notable secondary colleges. A Catholic orphanage (1855) and convent was expanded with a Catholic girls’ college (1865). Opposite the girls’ college the Geelong College for Boys opened in 1870 under the leadership of Dr George Morrison, father of Ernest ‘Chinese’ Morrison. Beginning as a Presbyterian college, it came under the Morrisons’ ownership (1864-1907) and then reverted to the Presbyterian and Uniting churches. It became co-educational in 1974. A boys’ Catholic college opened in the former orphanage in 1935. Primary education began with church schools and a national school. Chilwell had an Anglican school (1854-78), Catholic school (1854-76) and Wesleyan school (1855-78). Newtown had a Wesleyan school (1850-74), Anglican school (1851-77) and National school (1856-63). These were succeeded by the Chilwell and Newtown government schools (1879, 1877). The Fyans Park State primary school in west Chilwell opened in 1965. Chilwell’s early riverside industries were replaced by substantial manufacturing concerns. Several chose high ground known as Rocky Point, between Shannon Avenue and Latrobe Terrace. They included the Austral paper mill (later a woollen mill), an ice works (1854), the Albion and Union woollen mills (1869, 1874) and a flour mill (1856-86). There were also a soap manufacturer and a little to the north the Returned Soldiers and Sailors woollen mill (1922). Newtown was connected to Geelong’s electric tram network in 1912 with a service along Aphrasia Street, ending at Shannon Avenue. There was also a tram line along Pakington Street, which was extended in 1927 to run from Aphrasia Street to Fyans Street, Chilwell. Trams then served the private schools and the Pakington Street shops until the service ended in 1956. Not all of the river bank was monopolised by industry. In the north the borough had Queens Park (1857) on the west side of the river, where a council golf course was laid out in 1939. The park is the home of the Newtown and Chilwell Cricket Club and the venue for annual Highland gatherings since 1959. In Noble Street there is the Bareena bowls club (1913). Many of Newtown’s gracious houses have survived and several are heritage-listed. A notable example is Barwon Grange (1856) near the river at the end of Fernleigh Street. Other heritage-listed buildings include early Methodist and Baptist churches (1854,1876), Geelong College (1871) and Sacred Heart girls’ college (1860). At the 2011 census, residents’ median incomes were 15% above the Victorian median.